Comparison: What is the Difference between PSE 9 vs. 8 vs. 7 vs. 6? One of the most common upgrade questions you’re likely to see is what’s new, what’s different, what’s improved, what’s changed between the new Adobe Photoshop Elements 9 and version 8? Or more fundamentally, what are the key new features in PSE 9, versus PSE 8, 7, or even version 6? We put together a short list here and a longer list (with details) at our product page here, but how about a feature-by-feature, version-by-version table? You’ll find this down below, but first let’s take a look at some of the biggest new additions. 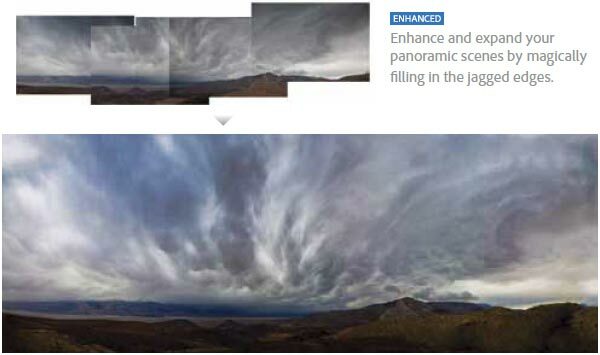 The two photographic “before-and-afters” on this page come from the new Elements 9 version just released. Do the images above seem familiar? They might – they were also in Adobe’s blockbuster Content Aware Fill “Sneak Peek” Video for Photoshop CS5… So for starters, this is very good news for the new release of PSE9. Photoshop Elements 9 uses powerful technology to make even the most complex results achievable for anyone. Adapted from Photoshop CS5’s celebrated Content Aware Fill feature, the new content intelligence in the Spot Healing Brush analyzes what’s in the image and quickly de-clutters or repairs photos (like removing tourists from a crowded scene or an obstruction, such as a telephone pole) with a swipe of a brush, magically filling in the background. The same content intelligence synthesizes missing pixel information to create a stunning panorama from multiple photos, without leaving any gaps or blank spaces. Another major new feature in Photoshop Elements 9 versus version 8 is Layer Masks. This is probably the single most requested capability that Elements has been missing since it first came out. Layer masks are a powerful feature for editing photos non-destructively and one of the most-used functions in the full Photoshop, so will be a big asset to Photoshop Elements. I just received Adobe Photoshop Elements 9 for Christmas!! Is it really true that it does a poor job translating to Microsoft word works? I want an easy program to use… What is the difference between APE9 and AL3? Hi Brenda, thanks for your comment and questions. That’s great you just got PSE 9, and you’ll probably be quite happy with it. Not sure what you mean though about translating to Microsoft Word/Works – please feel free to give more detail on what you’d like to do. 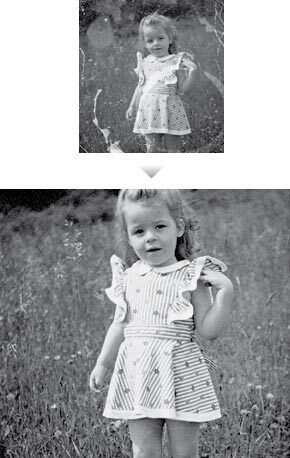 As for the differences between Adobe Photoshop Elements 9 and Adobe Lightroom 3 – well to start, Photoshop Elements is at its core a pixel editor, while Lightroom 3 is more of a photographer’s workflow and data management solution. Many people use both, actually – together they comprise a complete image processing system. More detail on the comparison/contrast and their complementary nature is laid out here in this recent forum post. Your best bet is to just download the free trial(s) of whichever Adobe software you’d like to try. The downloads are immediate and work with all features and functions enabled for 30 days. Well…Lets see, I was on here reading another guys comment on how APE9 had some glitches with Microsoft word. So I was curious if I will have the same problem on my Hp/Pc with Windows Vista. I have Microsoft word works,maybe it has nothing to do with the APE9… I do not know! I am still not sure if I should return my APE9 and go with AL3? I have tried to download AL3 before and did but I couldn’t get to it to try it. Not sure why? I take many photos with my Nikon D30000. it has an editing program which I barely use as most of my pictures come out nicely. What I do want to do is have an option to put frames around the pictures, and have fun with them @ eliminating unwanted backgrounds, if I want to… Is that also available with APE9? Or is it just a complete pixel editor like you said and I need to start with AL3. Or maybe I’ll buy AL3 if I can get a good deal since you say they complement each other. Thank-you for your time…as I am completely new to the world of editing programs. Hello again Brenda, regarding Microsoft Word, you must be talking about this comment – which actually had to do with earlier versions of Adobe Acrobat, not Photoshop Elements… So, there’s no issue there. It sounds like from what you describe that a good strategy is to start off with Photoshop Elements, and then see how you get along. Photoshop Elements is good software and can do a lot of great things – and perhaps more “fun” things than Lightroom can, which is more on the serious and professional side. You can of course first run Adobe’s free trial for Elements too to help make up your mind. If you’re having trouble downloading the free trials from Adobe’s main page, you can use our direct download links instead to access the authentic software via Adobe’s servers but without the Akamai Download Manager they use, which causes problems downloading for some people. Here are the direct download links for Photoshop Elements 9 and Adobe Lightroom 3. Good luck! I just received Adobe Photoshop Elements 9 for Christmas but I bought a Bamboo pen + touch tablet for my husband which came with Adobe Photoshop Elements 7. I’d like to know if the differences between 7 and 9 are worth keeping version 9 or if its better for me to return it and purchase a different type of software that may compliment Adobe Photoshop Elements 7. We plan on using the editing software to both edit digital photos as well as scanned drawings and those which we will create with the pen/touch tablet. Other additions in Photoshop Elements 9 over version 7 include Layer Masks (huge), Auto-Analyzer, People Recognition, Photomerge, Style Matching, online photo sharing, special effects, home project printing, new templates, and a lot more. For all the major differences, see the full product and version comparison for PSE 9. Or you can just download the free trial for Elements 9 and then run and compare the two versions side-by-side if you wish (yes, they can both be installed at once). Thanks again and if you have any other questions please feel free to ask! I took a look at the full product and version comparison on the Adobe site. But from reading this site, I still am not sure what exactly all the features that come with 9 do. How and when would you use Layer masks? Sure Santina, the best thing to do in cases like these is consult the free online documentation for Photoshop Elements 9… Here is the complete chapter on Layers from the help manual. You can navigate from that page to any other chapter in the book to learn more about other features. Thanks again but the tutorial only shows how to use layers – not layer masks. Or am I missing something? There is a chapter subsection on Layer Masks in the documentation that is linked above… Layer masks are a powerful feature for easily hiding or showing part of a layer in a fully-editable, non-destructive way. Photoshop Elements has always had layer masks under the hood, but you couldn’t really work with them interactively. Now with version 9 you can. There are many creative ways to use layer masks, limited only by imagination really… Here’s a good video demoing one helpful application of masking; there are many more you can find with a quick search. This is the quote from an Adobe Guru I watched a video of some years ago… I’m an amateur photographer and bought an EOS Canon, which was shipped in those days with Elements 3. Not bad, but it couldn’t compare with Photoshop 7. But now when I compare Elements 9 with even Adobe Photoshop CS2 (which I have still on my laptop), I use Elements 9 most of the time. Good luck, we live in interesting times. I created a slideshow with music using Elements 7, but it appears it will only allow a CD to be burned. The image quality is very poor. I understand Premiere Elements will allow a slideshow to be burned to a DVD, thereby enhancing the image quality. Is Premiere Elements 9 compatible with an Elements 7 slideshow or do I also have to buy Elements 9 and recreate the slideshow in order to burn a DVD? I have used Photoshop Elements on my PC for years. Just got a MacBook and Elements 9 for Mac. I can’t find the (former F11 side by side compare) function on the Mac version. Is it there? Thanks, I found the compare feature. New Question: When I wished to attach a photo to an email in my old version, I exported the photo to a file that I used just for attachments. As I copied it, I was able to downsize the file for email. Because I am AOL, I have discovered that the “Share” email feature in 9 for MAC doesn’t work. I tried to export the photo to a flash drive, but wasn’t able to reduce the size of the file in the process. How can I export or copy a photo to another file and reduce the size of the file for email?? Hi, I don’t know where else to get some guidance I can understand. This is my problem. I just upgraded from a 6 yr old HP with XP to a custom build computer with Windows 7 Pro. I decided to upgrade from a PSE 6 to a PSE 9. Installed 9 on my new computer and “searched for pics” received many double thumbnails in catalog. That was my mistake but I also lost all “version sets” which helped me have all versions of photos that I’d edited and to be able to find my original etc. Loved the version sets as well as my tags etc. It frustrated me so much I wrote a “I’m not pleased with PSE9” on Amazon where it was purchased, and uninstalled 9 and installed 6 onto my new computer. I’m frustrated for 2 reasons. Cost of buying new software but I really do want to use the new features in PSE9. I just can’t seem to get past the organizer problem because I can’t efficiently locate my version sets to see what I’ve already edited etc. Help is greatly appreciated. Greetings Sharon, you might want to take a look at the online documentation for PSE 9, including the section on converting from older versions. There’s also an entire chapter on the Organizer including version sets. There’s also a good Adobe user-to-user forum that can help answer any other questions you may have – for example, the techniques given in this forum post may also help. Thanks for your comment and good luck with it! can i install Photoshop cs5 and Photoshop elements 9 together? Yes Pankaj, definitely – we have them both running on the same machines on our computers here! I am considering purchasing PE9. However, I have read lots of reviews saying the software crashes when using various functions most commonly the spot healing brush. Do you have any opinions on this issue? Hi Steve, thanks for your question. That was an early, temporary problem when Photoshop Elements 9 first came out in late September. It was actually fixed in November, so you should have no problems with the Spot Healing Brush now – we don’t have any issues here. But some of the early reviews may still reflect that occurrence. Anyway, that new feature is terrific (based on content-aware fill from Photoshop CS5), and is arguably worth the price of the upgrade all by itself. Our computer was damaged in a fire and although we were able to recover our photo files–we could not recover the Photoshop Software which we bought in 2005—believe it was 7, but not sure—anyway it ran under Windows XP on an E-Machines system. Now have an HP with Windows 7 and am wondering if we buy Photoshop 9—will it be compatible with our photo file—or do we have to build up our file from scratch. As for converting the Photoshop Elements catalog from an older version to a newer one – yes, that is possible! Good luck with it and hope you get everything back. I have XP as my operating system and installed PSE4 several years ago but am not familiar with using its more advanced features. I have a scanner and a lot of pictures that I would like to work on, but first I’d like to upgrade. I haven’t kept up with Photoshop Elements so I’m not that well informed on what improvements and changes have been made. What do you recommend for a very amateur novice? Are there books that can help me or would you recommend a tutor? Welcome skately, thank you for your questions. Yes, there are some very good books on Photoshop Elements 9. As well, there are some great free resources as well – check out these 4 hours of free video tutorials for PSE 9. What’s more, we even offer a free ebook for learning Photoshop Elements 9 right here on this site. Hope these help get you started! We travel a lot and I have always used PSE 4 to organize the many trip photos I have — with some frustration with its Organizer — disconnected photos, etc. Has there been significant improvement in ease of use in later versions — esp. PSE 9? Greetings E.M., Photoshop Elements 4 must be about six years old now, and unfortunately nobody here can remember much about it particularly relative to current versions… Definitely there have been a lot of improvements since then, and we use the latest Organizer here without difficulty. One thing people sometimes say about the recent releases is that the Organizer is a bit slow on older computers, but that is probably also a function of the increasing numbers of digital photos taken and stored generally. If you move up to Photoshop Elements 9, you should be able to convert your photo catalog from an older version to a newer one (on Windows) – see the PSE online documentation about this. If you like, you can always just download a free trial and try it out for yourself – there’s no interference, and it will work and run side-by-side with your current version. I have Photoshop Elements 5 as it came with my Canon Scanner. If I purchase PSE 9, will it absorb all my PSE 5 pictures into its program, or do I need to save the photos and delete PSE 5 first? Hi Frank, please see the comment immediately above yours – thanks! I have an 11-year old computer with Photoshop Elements 4. I am about to buy a new computer and would like to install Photoshop 8 or 9. Which would be best, I really don’t want anything too complicated. Also when I change over will I lose all my collections and have to redo them? But no need to choose between either of those – you probably really want Photoshop Elements 10, which was just released and is better than both. For your last question, yes – you should be able to import over your photo catalog – please see this earlier comment and response on how to do that. I just got photoshop elements 8 with my new scanner. As I am completely new to photoshop I was going to buy the photoshop elements for dummies book to help me get started. However now ‘dummies’ is version 9. Are the differences between 8 and 9 so significant that it will be totally confusing? I will probably get a later version in the future. Generally the main interface is similar, so you shouldn’t have a problem if you focus on learning the basic functionality. Most will still apply. Also check out our free downloadable eBook for PSE 9, which may also help – though once again, it’s for a newer version. You may also like four hours of free online video tutorials for Photoshop Elements 10 & 9, as well as the same for PSE 7 & 8. One more thing – I am using a Mac. So you’ll see things like the entire Organizer that actually did not exist in Elements 8 for the Mac, but was finally added for version 9. I have a quick question. We had an employee in the office that made several documents with their version of Adobe Photoshop 7.0. A new person has been hired for that position & has continued using the the documents and just making small changes. However the computer crashed and a new one was purchased. Of course the previous employee did not leave the Photoshop 7.0 disk and we will need to purchase a new program to be able to continue editing the documents. So here is the question…Which program will work with Photoshop 7.0? Adobe Photoshop Elements 5.0 – Old Version ??? Adobe Photoshop Elements & Premiere Elements 7 [OLD VERSION] ???? Adobe Photoshop Elements 2.0 [OLD VERSION] ????? Sorry Tammy, those are all pretty ancient so it’s hard to say… The latest supported release of Photoshop Elements (PSE 12 with free trials available) should be able to read those files, and you’re much better off with that then trying to buy some old version which is not safe. Photoshop Elements 9 / Premiere Elements 9 Direct Download Links Photoshop Elements 9 and Premiere Elements 9 are Out!